Our local bakery, closing 13 October 2012, a sad day for Great Crosby. There’s a hush fallen over the world. Snow lies deep on the ground and barely a car creeps by. The sky’s an odd shade of grey and the clouds hang low in the sky. It’s as if a great duvet’s been flung over Crosby, plumped up with snow, not feathers. Outside Marshalls, blinds already raised for the day and fruit stacked waiting, Anthony shovels the path clear and Karen from Smithies walks her dog Jack – both in warm coats. Behind the seasonal sparkle in Alexandras’ window Pat’s arranging flowers. A glow the colour of golden syrup greets the street like a welcoming beacon across the road. Christmas trimmings edge the window. A pile of white delivery trays, already emptied of weekly treats and daily staples, stands waiting for the dark red van. Soon it will drive round the corner, past more flowers at Florettes, past the Post Office with its cards offering piano lessons and cars for sale, to take the trays away. ‘Celebrating 100 years’, it’s Satterthwaites. Sara’s in her uniform, the apron, the hat that changes everyone’s appearance so you barely recognise them in the street, yes, she’s quietly in charge. Less than half a mile away the bakery’s been busy through the early hours, alchemists at work transforming flours and sugars, creams and oils, meats, fruits and vegetables into breads, cakes and biscuits, sausage rolls and pies. By lunchtime the queue will be out the door. People with eager eyes scan the shelves of bread, glance at the mince pies, linger on the cream cakes and fancies. ‘Fancies’ – what a lovely term. A bakery has a language all its own: barms and tins, Japs and Bavarians, Florentines and Russian slices, multigrain and sunflower rye, sliced or unsliced. A ring of potato cakes for me, please. Workmen leave with bags of hot pies, mums with carriers bulging with bread, children with currant-eyed gingerbread men, elderly men with white cardboard boxes tied with blue ribbon. Busy, yes, but the staff still have time to take that extra bit of care with those who need it, popping out to the street to discuss a special cake with someone who can’t make it into the shop, chatting between times with the woman with the long grey hair who perches inside the window – part of her daily routine, gets her out the house. That’s what makes local, independent shops so different. It’s an extension of your home, in an odd sort of way. People you recognise and get to know by name, people who remember what you like to buy, who pass the time of day. Your shops. By mid-afternoon more or less all the bread has gone, a few cakes and biscuits remain for the late shoppers, maybe a lucky passer by will snap up a lone pork pie that hasn’t found a home – though it won’t be a warm one (the pie, that is). As darkness creeps over College Road the snow is back, dancing down in the cheerful light gleaming from shop windows. The Christmas trees over the Bug look perfect with their dusting of white, Gillions is doing a brisk trade in sausages, traffic is taking it slowly and the pavements are full of cautious pedestrians. 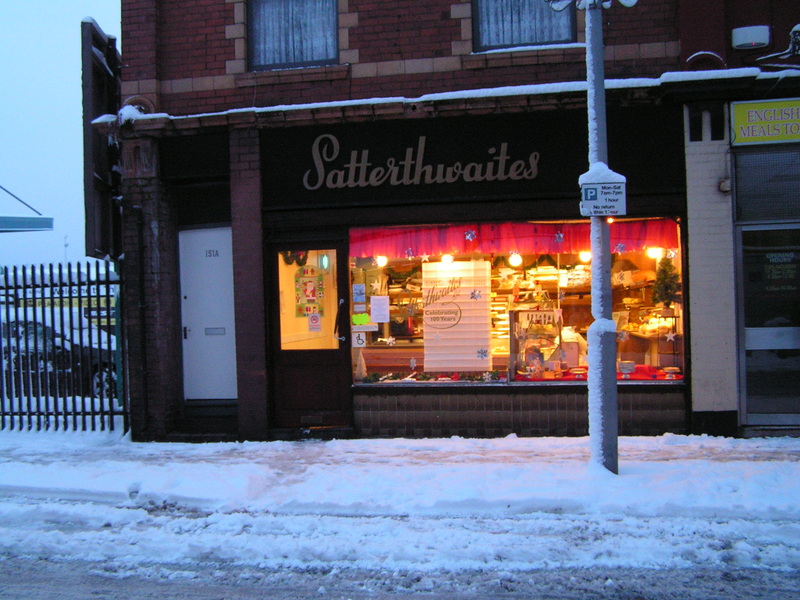 Satterthwaites is the first to shut up shop, but we know it will be back again, Monday. So, Satterthwaites, we have to say goodbye. It’s not till you start to list the things you’ll miss that you realise it’s not just the cakes, the bread, the pies, the friendly faces. It’s more than that. And we can hardly complain, can we, those of us who love the idea, but shop with our cars at the supermarkets and convenience stores. Come the snow and your car won’t start or the road is blocked you make your way on foot to the all-weather dependable local shops. And then you realise. This entry was posted in Thinking, or ranting, or both and tagged bakery, Cakes, Christmas, Crosby, Liverpool, local shops, pies, Satterthwaites, shops, snow. Bookmark the permalink. I actually had a tear in my eye reading this. That old lady stops my daughter every time we are on college road; you have captured the spirit of Satties perfectly. Surely we can have a community buy out???? My Nan – Nellie Wallwork Died on 5th October 2012, she loved this bakery. Her favourite was a devon delight cake. I would buy one on my way to visit her at her home in fairfield, I will miss her so much. She was cremated on 12th October aged 94 years. Guess she must have thought no more devon delights its not worth going on! That’s a lovely, poignant story Jayne, so sorry about your nan. I never had a Devon delight, too late now.